But the company shifts its holiday forecast downward. Though Intel’s PC group, data center, and Internet of Things businesses helped drive Intel to record revenue in its third quarter of 2016, all eyes seemed focused on one number: the company’s fourth-quarter forecast, which isn’t great. Intel achieved a 9 percent year-over-year increase in profits, up to $3.4 billion, and a 9 percent increase in revenue as well, to a record high of $15.8 billion. Unfortunately, the company’s projections for fourth-quarter revenues are actually slightly down: $15.7 billion, with some $500 million either way in terms of wiggle room. Traditionally, Intel sees its highest revenue in the fourth quarter, so the numbers provide an indication of how the holiday tech sales season is expected to go. What this means: In all, it was the sort of topsy-turvy earnings report not usually associated with Intel: The Client Computing Group, which oversees Intel’s PC processors, reported 5 percent growth, which was higher than expected. That flies in the face of continued predictions that the PC market is in decline. Intel also reported that revenue from its enterprise businesses—usually a strong, stable sector—hadn’t quite met expectations. Intel executives didn’t talk much about the company’s products, let alone specifics. But the company’s next frontier is 3D Xpoint, which executives hope could one day replace the flash memory technology used in today’s SSDs, and update computer memory as well. Intel executives said 3D Xpoint is now sampling to customers, who will begin qualifying the next-generation memory technology at the end of this quarter. (Qualification is a testing process to ensure a number of things, including the viability of the technology and its compatibility with customers' existing products.) Brian Krzanich, Intel’s chief executive, said that sales of the products would begin in 2017 and increase throughout the year. 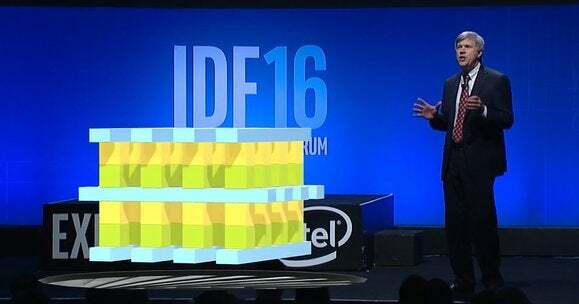 As Intel ramps up production, 3D Xpoint’s costs should decrease, he added.